Sight Word Mighty Maid is played similar to Old Maid but uses sight words and a mighty maid in lieu of numbers and an old maid. The goal of this card game is to avoid getting the mighty maid card which is truly one of a kind! My children always loved playing this popular card game and I thoroughly enjoyed watching their faces as they both selected and passed the infamous maid card. It was always hard for me to keep a straight face throughout this game. Using index cards or perhaps you can locate an old deck of cards that is missing a few cards, make duplicate game cards. 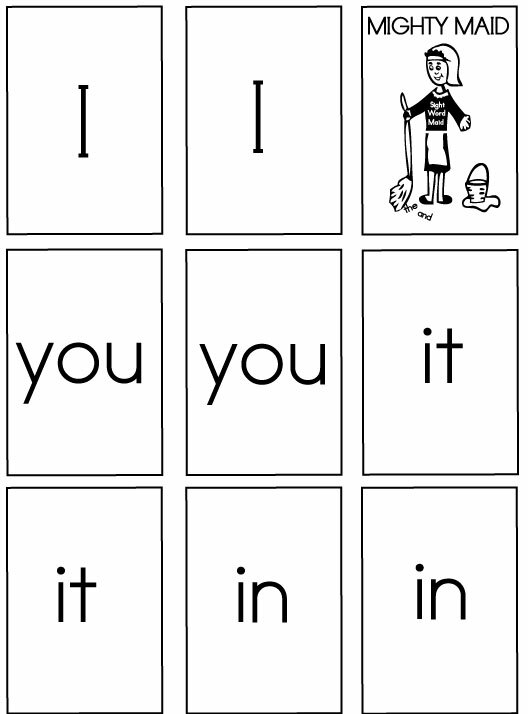 Write each sight word on two separate index cards or piece of paper and mount onto an old deck of cards. It is important that you can NOT see through the card. Print out the might maid cards below and mount them onto an old deck of cards or index cards. Remember – you only need one mighty maid. Using the criteria in the section below, select an appropriate number of pairs that is best suited for your child. Depending upon your child’s reading readiness, select an appropriate number of pairs to play with as well as one old maid card. 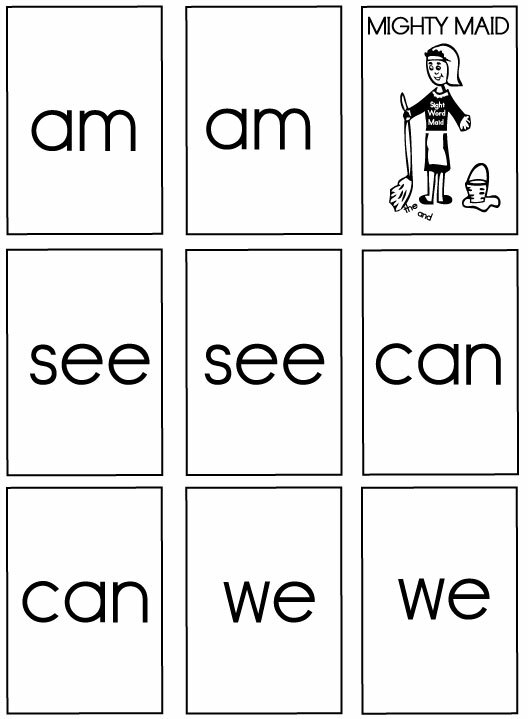 A child, who does not possess a sight word vocabulary, should begin with a few pairs and gradually increase the pairs as she masters each sight word. A child, who recognizes some sight words instantly, should play with a deck containing both the words he knows as well as ones he does not automatically recognize. 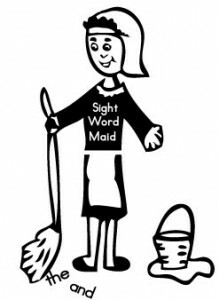 A child, who possesses a good sight word vocabulary, should play Mighty Maid with 25 sight words. 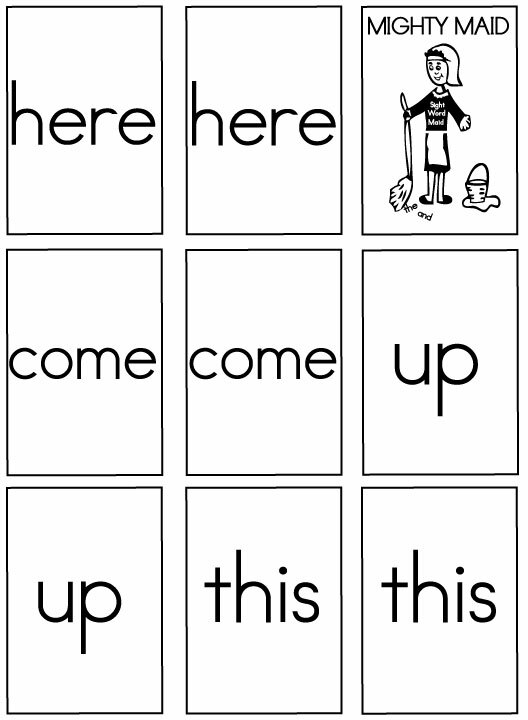 Practice makes perfect – playing the card game will reinforce automatic recognition of sight words. The object of this game is to avoid holding the mighty maid card at the end of the game. To begin, deal out all of the mighty maid game cards. Each player will look at their cards and discard any pairs. As a general rule, each player will select a faced down card from the player to the left. The youngest player starts by selecting a card from the player to her left – she should not allow anyone to see it. If she has a pair, she would place the two cards face up on the table. Play continues clockwise so the player who just had a card taken would select a card from the person to his left and so on. Eventually, all the cards will be “retired” with the exception of the mighty maid card and the player that holds this card loses the game. I prefer to fan out my cards but that can be burdensome to a child with small hands. When I possess the mighty maid card, I like to strategically place it slightly higher than the other cards – in hopes it will be selected. Since the underlying object of this game is to develop a sight word vocabulary, every time a pair is “retired“ – it should be read aloud. If your child doesn’t automatically recognize the word, help them to pronounce it or have another child read it. 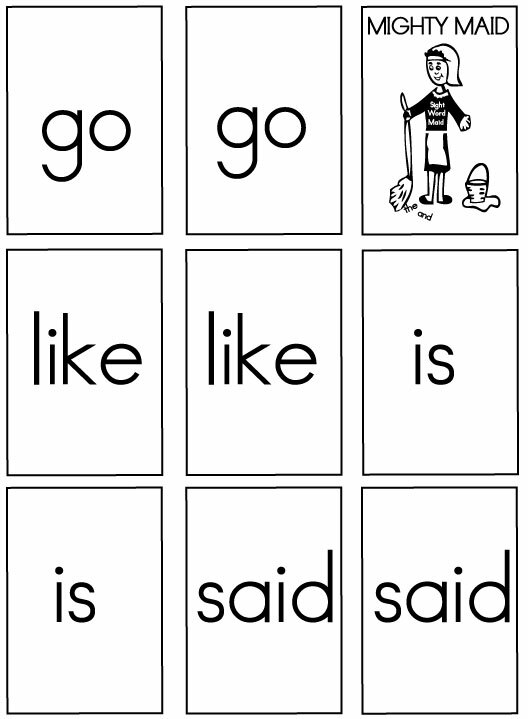 Many sight words are phonetically irregular so they will need to be learned as whole words. 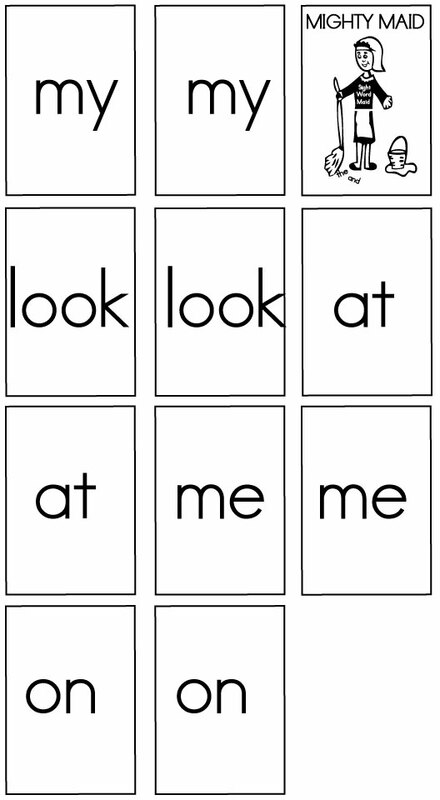 If possible, review the cards prior to playing – repeated exposure to sight words helps a child automatically recognize sight words. Sight word games are entertaining activities that help develop a child’s sight word vocabulary. 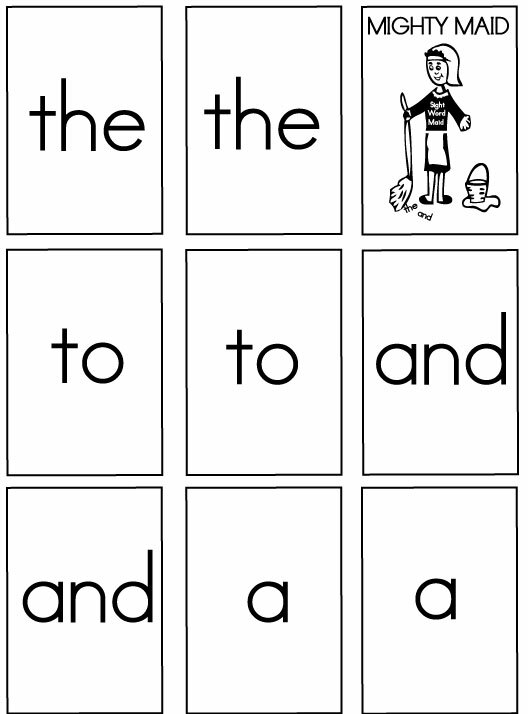 For more information on sight words and related games, please read our related articles below. It is odd that your first 5 cards for Mighty Maid are uniformly sized and print perfectly and your last page isn’t. I cannot use this last page with any other set of cards because p. 6 prints smaller than the other pages. This doesn’t make sense to me. This is a great idea. However, since I do not like the traditional “Old Maid” game where the person holding this card loses, I changed the Maid to a Frog, and have the person holding the Frog card say or shout, “Ribbit! Ribbit!” They also have the choice of leaping while saying it. This way, no one is a loser and everyone has fun at the end.